Fitzhugh Lee was born in Fairfax County, Virginia, on November 19, 1835. The nephew of Robert E. Lee, he attended the United States Military Academy at West Point. Although his uncle, serving as superintendent of the academy, almost expelled him for misbehavior, young Lee managed to graduate in 1856. Seriously wounded while fighting in the Indian wars, he became an assistant instructor at West Point in 1861. In May of that year, however, he resigned to become a first lieutenant in the Confederate service. 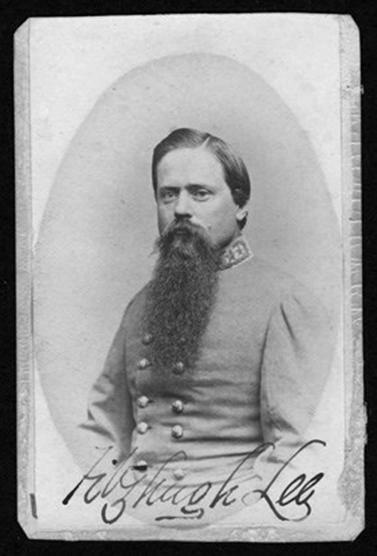 Serving as a Confederate staff officer in the Peninsula campaign, he was eventually promoted to brigadier general (July 24,1862) and major general (August 3, 1862). At twenty-seven, he was one of the youngest cavalry commanders in the war. Called “Fitz,” he led a brigade through the Antietam campaign and at the battles of Chancellorsville and Gettysburg. Wounded at the third battle of Winchester, he stayed out of action until the last leg of the war, in which he served as Gen. Robert E. Lee’s chief of cavalry corps. Fitzhugh Lee surrendered right after Appomattox. After the Civil War, Lee was elected governor, worked as a farmer, and was appointed consul general in Havana. He served in the Spanish-American War as a major general in the US Volunteer Army and retired in 1901. He later wrote a biography of his famous uncle, as well as other works about the Civil War. Lee died on April 28, 1905, in the District of Columbia.